Children of different ages have different interests, abilities, and needs for play. The Mid-Hudson Children’s Museum understands this and is pleased to offer a menu of themed birthday party options that are appropriate for your child’s age. Our themed parties are hosted by a member of the museum’s staff and each includes a hands-on 30-minute activity to engage and delight your child and party guests. Inspired by the book “Trains Go” by Steve Light, young children learn about the different trains and the sounds they make as they go huff, puff, chugga, chugga, and toot toot! Children are then led through an art activity using shapes to create their own train. Paint and Sippy Cup NEW! Children will finger paint on a canvas which has the letter of their name taped on. (Markers provided for those who do not want to get their hands dirty.) After the painting is dry, peel up the tape, and reveal the letter! Inspired by the art and illustrations of Eric Carle, children create a caterpillar and butterfly collage in this hands-on art themed party. Children explore animals and movement in three dimensions through sculpture and puppetry. Young children become inventors, combining art and science as they construct vehicles powered by rubber bands, gravity, air and other forces. Can you dig this? Explore objects from Long, Long Ago and learn about our life-sized fossil skeleton replica of the Hyde Park Mastodon! Children will become Junior Paleontologists and make their own fossil specimens. Come experiment with us! The Science Center @ MCHM supports early STEM education. Our “wacky” science host will lead children in performing super cool science experiments and in creating their very own slime! Come sail away with the MHCM crew! Pretend play is essential for early childhood development. What better way than becoming a friendly pirate for the day? Inspired by our new “The High Seas” pirate ship exhibit, pirate guests will learn to talk like a pirate and design their own treasure map as they set sail for adventure! Celebrate and create! Choose from a ‘Paint on Canvas’ or ‘Sculpture’ project. Picasso said “Every child is an artist”, so dress for mess and create a masterpiece! Using simple materials children explore rhythm and tone as they create their own musical instruments in this wonderfully creative activity. We live in a region defined by water and waterways. Through hands-on science crafts, this themed party focuses on what lives under water and how it is they can. Children will create their own “underwater” adventure with sand, seashells, fish and even a wave! Young children explore the yummy side of science as they create and flavor their own handmade ice cream. Does your child want a Unicorn Super Hero Party? Can’t find the theme you want? We now offer NEW Customized Parties! Your party will be ‘branded’ with your chosen theme, created especially for your child, to make your event a very special celebration! Customized Themed Parties include all the great things in our Themed Parties, but designed especially for you! What is your child’s favorite thing? 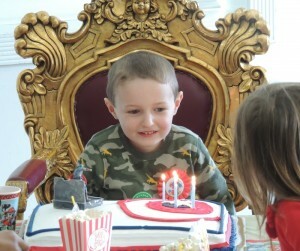 Please make your Custom Themed Party reservation at least 45 days in advance of your preferred birthday party date.